Memory + paraphernalia = memaphernalia, the stuff of memories. The Bluebird of Happiness. Grandma Sally, my mom's mom–who I took to calling Midge during her last years, as osteoporosis riddled her bones and made her The Incredible Shrinking Woman–had one of these glass confections perched in the window sill above her kitchen sink. For as long as I can remember. It had a chipped beak, which I suspect was the product of how good its weight felt in a child's hand and that children have a propensity to drop things. When The Husband and I bought our first house we had needs. Of course we needed to get a new armoire for the TV. We needed to get him a desk for the new office. We needed to get a honest-to-goodness bedroom set. 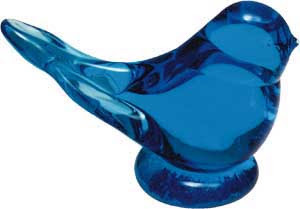 And I needed my own Bluebird of Happiness. So I went looking. And I found. You can buy these babies all over the Internet, and I found the one I wanted on eBay. It looked exactly like Grandma Sally's. Ordered it, I did. Received it, I did. And love it, I do. When Whitney and Ethan bought their first home, they had needs. A new kitchen table to fill with Whitney's creations. An honest-to-goodness bedroom set for the master bedroom. Twin beds, one for Jack and the other for the guest room. And one need they didn't know about, yet I fulfilled anyhow: Whitney's very own Bluebird of Happiness. I bought Whitney's from the original creators, Terra Studios out in the Ozarks, and it too looked just like the one Grandma had, only with a beak intact, ready for breaking. I eat breakfast at our island kitchen bar every morning, and that just so happens to be where the builders installed the kitchen sink. Which, of course, is where I perched my Bird. It's not on a window sill like Grandma Sally's was, but it's near enough to the sliding glass doors to catch a bit of sunlight every now and again. My hands are small, like a child's, and sometimes I pick up the bird, because it's just the right size to feel good in my hand. And though I have a propensity to drop things, it hasn't happened yet. And so this bit of memaphernalia of my Grandma Sally remains intact. I can't wait to have my own house so you'll buy me one of these for my very own. You will buy me one, won't you? how did i miss this one? this is really beautiful.